The Taco Truck, the Driver, the 23 lb Super Taco, Mama Salsa & Daddy Guacamole! We are the Taco Family! We LOVE tacos (but who doesn’t?!) and our 2 year old son loves trucks so we converted his stroller into a taco truck! We used white foam board for the sides and painted cardboard for the front and back. We cut the truck out, used Velcro to adhere all 4 sides together, that way we could take it apart and put it in our car trunk to transport to different events. It was hung on the stroller with wire coat hanger. We hung a strand of hot pepper lights and drew on it with marker. Our logo: Los Dos Bros Tacos = The 2 Bros Tacos! Our 1 year old baby boy Greysen was the World Famous 23 pound Super Taco! We used foam from a mattress topper and spray painted it a yellow taco color. I crocheted a brown blanket for the taco meat and used green crepe paper streamer for the lettuce, orange felt for the cheese and crocheted red squares for the tomatoes. He was so darn cute and everyone wanted to eat him up! His brother, our truck loving 2 year old Colten, was the taco chef/taco truck driver! We put a sombrero on him, wrapped an apron around his waist, put a hand towel in his back pocket and drew a mustache on him with eye liner. I made mini taco piñatas out of tissue paper, cereal boxes and tape and filled them with candy for him to pass out of the truck to the neighbor kids on Halloween! That was a huge hit in the neighborhood! He was overjoyed that he got to drive the taco truck around town! I was the mom of the 2 brothers, Nicole, Hot & Spicy Mama Salsa! I wore a store bought salsa shirt with hot pepper leggings and tomato earrings. I made a headband with 2 hot peppers on it. My husband Mike, was Daddy Guacamole...and Yes!...he was extra! He wore a green sweatshirt that we put the word extra across and scraps of white and red Velcro for the chunks of onion and tomato. We cut an avocado out of cardboard and painted it and he wore that on his head which served as the avocado seed! Our family costume seemed to be a huge hit everywhere we went! We had random strangers asking if they could take our photos and if they could buy some tacos!! They told us their mouths were watering at the sight of us! The neighbors all got a good laugh! 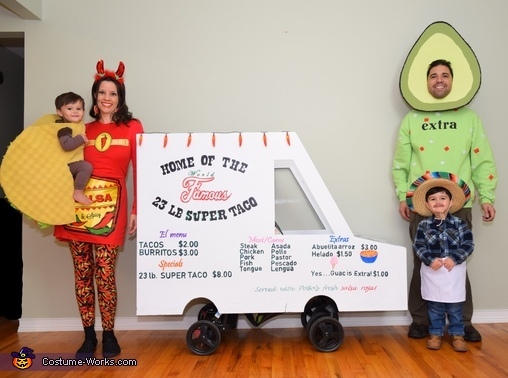 Taco ‘bout a fun costume, our family enjoyed Halloween this year and we hope you did too!